Every layer of these salsa meatball minis is as tasty as the other. From melty cheese to the chunky salsa, you'll love Salsa-Meatball Appetizers. Cook meatballs as directed on package; cut in half. Place in large bowl. Add steak sauce and salsa; toss to coat. Cut cheese slices in half. 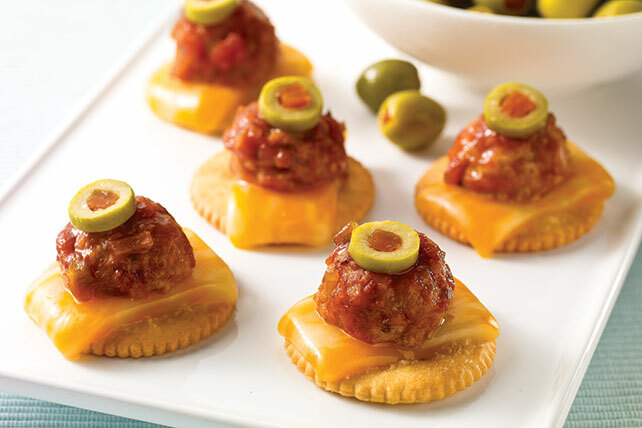 Place crackers in single layer on baking sheet; top with cheese and meatballs. Bake 4 to 5 min. or until cheese is melted. Top with olives. For spicy tapas, prepare using medium or hot salsa. Top each with 1 jalapeno slice instead of the olive slices.